Engagement Pod – Let’s be honest, your Instagram engagement pod is no secret anymore. Since Instagram introduced the new algorithm that would alter the platform as we know it, people are coming up with ways to gain advantages over the competition. The hypothesis behind these groups is that it helps gain footing and engagement on your new posts, which at that point transforms your account into the top priority on your devoted followers feed. One Engagement pod, Envi Engagement, has taken the initiative to brand themselves as a professional platform free of “leechers” (users who do not engage, but post and receive likes and comments). They also promote themselves as a spam free environment with strict moderation from trusted admins and group watchdogs. Real Engagement. Real People. Really Fast. Envi Engagement consists of 3 groups: “Dx6”, “Dx12”, and “24 Hour”. The concept behind these are based on the amount of instant engagement the users are looking to get in return for their shared interest. “Dx6” is code for “Done times Six”, which is an indication that the user has liked and/or commented on the previous six posts. The concept is the same for the “Dx12” group. Both of these are typically more attractive to users that are looking for an instant boost in engagement, that ultimately will end once either 6 or 12 more posts come after theirs. The 24 hour group, is an alternative choice that users can select because of its time-release effect on the content that is posted. Users are required to engage on all other group members posts from the previous 24 hours. This is often an extensively time consuming task. However, this type of group pays its dividends by providing long term engagement and higher numbers in overall likes, comments and views. How does an Engagement Pod work? 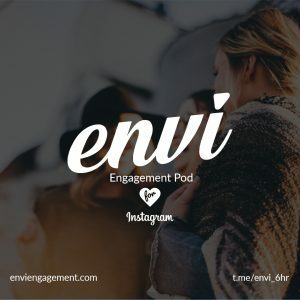 Envi Engagement, like many other Instagram engagement pods, operates inside of the Telegram app – a private, cloud based messaging application (much like the popular WhatsApp messenger). With Telegram, you can send messages, photographs, recordings and documents of any sort (doc, zip, mp3, and so on). You can also make groups and super-groups for up to 100,000 individuals and channels for broadcasting to unlimited audiences. Unlike other engagement groups, Envi allows any of the group members to apply to become admins. According to the Envi website, “The Community is in Control“. Other groups are often moderated by only a few individuals. Envi seems to have broken that trend. There are hundreds – if not, thousands of engagement websites, groups and applications on the market. They often yield little to no results. Envi actually delivers. Why not give it a try? Envi seems to be the outlier in its industry. The absence of advertisements and sales pitches in the group prove its worth a shot. Envi Engagement is a seemingly refreshing opportunity for those looking to genuinely grow on Instagram. According to Envi’s homepage credo, the groups are “Engagement for People, Not Profit“.